Elijah Streams: Miracles Breakout - Deaf Hear, Blind See, Dead Raised! Miracles Breakout - Deaf Hear, Blind See, Dead Raised! One of the most passionate men of God I know is Todd Bentley, who brings souls into the Kingdom of God. Watch now as you learn more about what God is saying and doing these days to bring people to Himself. I hope Todd's energy and excitement for souls is contagious for you!! By the way, these in-studio tapings are hugely expensive so Derene and I appreciate so much your generosity in supporting this ministry so we can keep these videos coming to you! Also we put together a new and exciting offer by Todd Bentley exclusively for our Elijah Steams viewers. To view and order his products click here. Don't miss this show on GOD TV (via DirecTV), every Tuesday at 2pm Eastern (11am Pacific). 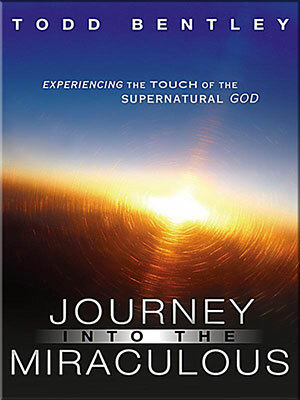 Todd Bentley’s best-selling book: “Journey into the Miraculous” and 3-CD set—will help you learn to sustain revival and move in the miraculous – in your own life! In this amazing offer, you’ll read extraordinary testimonies of the miraculous from people around the world who’ve experienced healing and revival – and you will experience the same thing too! You want revival in your life—but do you have what it takes to sustain and maintain it when it comes? In this anointed 3-CD set, Todd Bentley unpacks “three major themes” to help you unlock revival breakthrough and how you can maintain it! Don’t miss out on this sensational package by Todd Bentley made exclusively just for you – our Elijah Streams viewers!